Laura Marano stops to pose while arriving at a private estate to celebrate the launch of YSBNow on Saturday afternoon (October 17) in Hollywood. 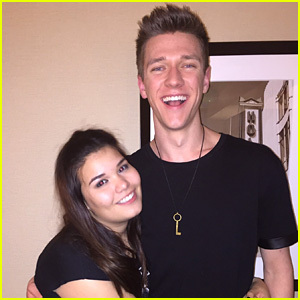 The 19-year-old Austin & Ally alum was joined by Isabela Moner, Albert Tsai, Forrest Wheeler, Asia Monet Ray, Sophie Reynolds, Rio Mangini, Madison De La Garza, and August Maturo. 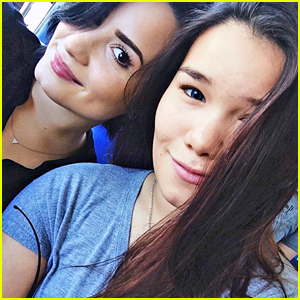 How cute is this pic of Madison de la Garza with her sis, Demi Lovato? Super cute! “I think when people say they wish Demi Lovato was their sister, they don’t realize how hard it is to be related to someone who’s constantly away on tour,” Madison, 13, dished in a new interview with Seventeen mag. Madison De La Garza poses with her pal Collins Key while celebrating her 13th birthday at Cold Stone Creamery on Saturday night (January 31) in Universal City, Calif. The young actress (and sister of Demi Lovato) had a blast celebrating her friends, including Bea Miller, Diamond White, and Cole Plante. “I know I’m kinda late but thank you so much @BackstageEvents & @ColdStone for helping me out with my birthday party! It was a huge success,” Maddie tweeted. Happy belated, Madison! Check out more fun pics below! 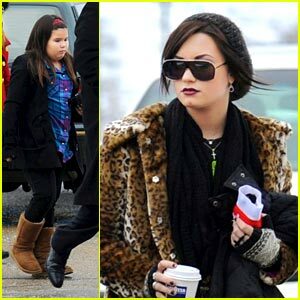 Demi Lovato keeps warm in an animal-print coat as she spends Christmas Day (December 25) with her family in Chicago. As previously reported, the 18-year-old actress/singer spent most of the day with her family and returned to her treatment center outside of the city later that night. Demi‘s family, which included mom Diana, stepdad Eddie, and sisters Dallas and Madison, went to see a movie at a Hollywood Blvd Cinema, Bar & Eatery. WHAT MOVIE DO YOU THINK Demi and her fam saw? Ally Maki and David Lewis pose in front of Hallmark’s Hoops and Yoyo booth as they arrive at Melanie Segal’s Teen Choice Retreat Presented by T.J.Maxx held at The Magic Castle in Hollywood on Wednesday afternoon (August 4). Even Demi Lovato‘s lil sis Madison de La Garza made it out to the gifting suite where she was spotted getting her nails done by O.P.I. Also, Ally has a small part in Step Up 3D — which hits theaters TODAY! Go see it and support her! Maiara Walsh pulls her hair up in a classic updo to attend the 9th Annual Padres Contra El Cancer’s “El Sueno de Esperanza” Gala held at The Hollywood Palladium in Los Angeles on Thursday evening (September 10). The 21-year-old blue-eyed beauty joined Desperate Housewives costars Eva Longoria Parker, Madison de la Garza and Daniella Baltodano at the event. Don’t you just love Maiara‘s dress? The new season of Desperate Housewives premieres Sunday, September 27th @ 8PM ET/PT on ABC.